When I went to see Interalia yesterday afternoon I managed to walk past the gallery twice, before an extremely helpful passer by finally pointed me in the (obvious) right direction. This worried me: if I can't even find the gallery, will I be equally unperceptive when it comes to the art? But once I walked in, my fears were dispelled. The sculptures on show beautifully capture some of the main notions that underlie the science that inspired them: symmetry, simplicity and duality. Interalia, a show by Grenville Davey and David Berman. Image courtesy Chelsea space. Interalia showcases work of the Turner Prize winning artist Grenville Davey, developed in collaboration with the theoretical physicist David Berman. Berman has spent the last 20 years working on string theory and has played a leading role in developing a related construct called M theory. Symmetry is an important concept, not just in those theories, but in all of physics. And with symmetry comes the idea of duality: just as your left hand has a symmetric dual (your right hand) so many objects in physics also come with a partner, though here the symmetry is often hidden and not as easily spotted as a mirror image. Davey has long been interested in relationships and pairings between objects. He has worked with Berman during residencies at Queen Mary, University of London, and at the Isaac Newton Institute in Cambridge, to explore a particular notion in string theory called T-duality. Symmetry is the leading theme of the show. Many sculptures are made from wood, beautifully crafted to reveal the most symmetrical shape of them all: the circle. Just as a sphere can be thought of as circles of varying size stacked together, these wooden shapes appear as collections of circles blending together to form undulating round surfaces. 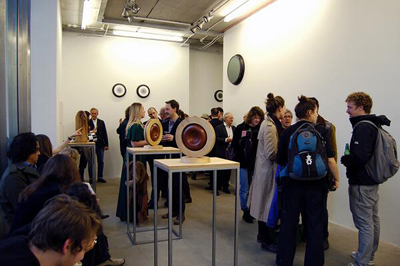 Some of the objects on show do come in pairs: there are twin pairs, for example two eye-like discs (adorning the wall in the image above), as well as dissenting ones, including a smooth-tipped wooden cylinder paired with a sharp-tipped paper cone with a crisp chequer board pattern. Other sculptures also come with a sense of "self-duality"; for example two bowl-like shapes (on the two tables in the image above) whose bulge on one side would fit perfectly in the depression on the other if they could only wind around themselves. These reminded me of the elegant and self-contained structures often encountered in mathematics — they make sense all by themselves, like idealised blueprints for shapes we might find in nature. M-theory multiple, as it was displayed at the Isaac Newton Institute in 2012. Image courtesy Isaac Newton Institute. But it's not all about perfection. While physicists believe that our world is governed by hidden symmetries, many of its features are a result of symmetry breaking. For a loose analogy, think of the laws of nature as a roulette wheel: round, spinning, and highly symmetrical, the wheel makes many outcomes possible. Our Universe is like the little ball you toss into the wheel: its motion is governed by the wheel's symmetry, but the eventual outcome, the ball settling on one number which determines its reality, breaks that symmetry. This broken symmetry is integral to Davey's works too (Berman made sure it was, see below). A series of nested, concentric circles have their symmetry violated by a tiny white disc moved off centre. This violation, like light reflected off a pupil, determines their nature — it makes them look like eyes, when otherwise they'd just be circles. Most beautifully, there is a wooden shape reminiscent of the Mexican hat diagram which played an important role in the theory behind the Higgs boson that was discovered in 2012, itself an example of symmetry breaking (see here for more). The sculpture is smooth and round, and at first sight highly symmetrical, just as a Mexican sombrero. But as Berman pointed out to me, the grain of the wood doesn't follow the circular form. As with Higgs' theory, nature has broken the underlying symmetry, determining the reality of what we see. I asked Berman what characterised his unusual collaboration with Davey. Lots of talking, he said, and occasionally some more violent measures: to make a point about broken symmetry Berman visited Davey's studio with a sledge hammer one day, and used it. But while the works were inspired by science, after the initial seed was sown, artistic and aesthetic notions led the way. Thus, some objects have lost their dual siblings along the way, and others have found unintended ones. 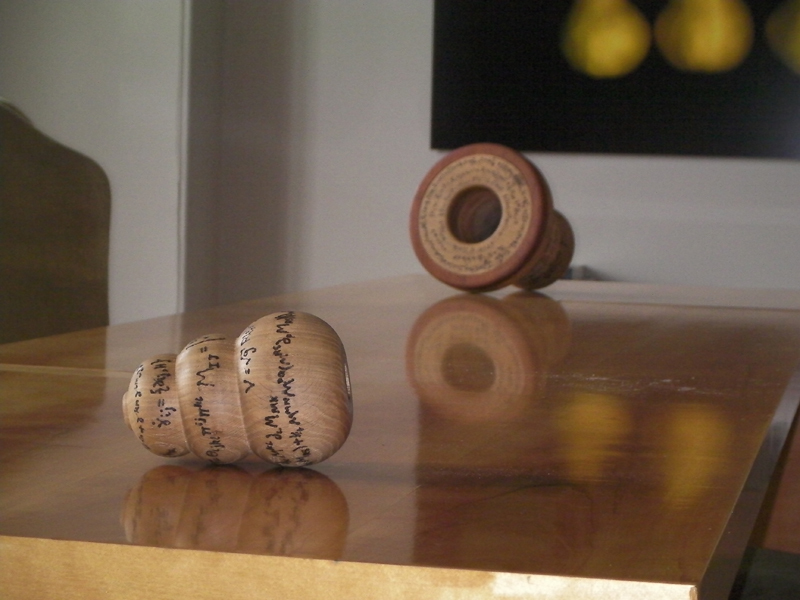 There are two wooden shapes, displaying the all-pervasive roundness with mathematical equations from Berman's work burnt into them, that were not originally meant as a pair, but eventually found each other and are now displayed side by side. Davey's work isn't a translation of science into art, but a place where both meet, conveying a sense of concepts that are central in both fields. Many of the works have been previously displayed at the Isaac Newton Institute. You can find a more detailed, and more articulate, account of them in this Plus article by Julia Hawkins. But if you would like to see the works yourself, then you still have a chance to do so. Interalia is on at the Chelsea space in London from today until 31st May 2014.